While pondering paint schemes for my recently-acquired collection of trucks, it occurred to me that doing a truck or two for the express and cartage services operated by Canadian National Railways would be most appropriate. 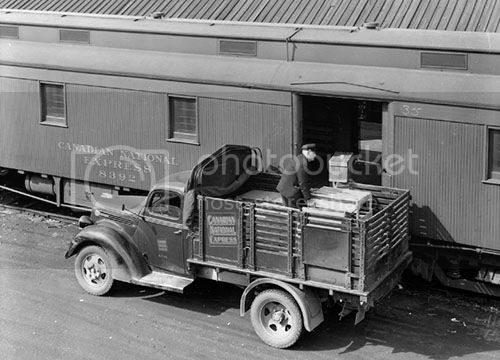 A bit of online searching turned up the essay CNR Trucking: Express and Freight Vehicles by Ian Wilson. It includes several great black and white photos that illustrate examples of the railway’s fleet. Ian’s essay has some great information about colours and lettering schemes. And now that I think of it, I know I have seen suitable HO models of 1950s-era trucks, painted and lettered for the CNR trucking services – so the colour information must be available. Also, lettering sets must be available – at least in 1:87. Perhaps I can persuade someone to do them in 1:64 for me. This entry was posted in prototype influence, resources by Trevor. Bookmark the permalink. You might be interested in the Yahoo group on 1/64 Vintage Vehicles. Not a whole lot of traffic, but some good info in the archives and people interested in detailing pre-1970 vehicles, mostly S scale modelers. You’re always a great source for sources of information. Thanks for this.